The title of these cute little cookies is a little misleading. I was feeling lazy today (I blame it on the sun) and I opted for Nutella instead of real chocolate. So really, they should be called "Nutella Thumbprints". Although, the "thumbprints" would be misleading as well, because the second shortcut I used, was using the end of a wooden spoon instead of my thumbs! Easy, easier, easiest. Anyways, they tasted fabulous! They were so tiny and cute. Perfect for a tea party! Rating: 4.5 out of 5. - Heat oven to 350 degrees. In the bowl of an electric mixer fitted with the paddle attachment, beat together 1 stick butter, sugar, salt, and vanilla on medium-high speed until smooth, about 2 minutes. Beat in flour, beginning on low speed and increasing to medium high. 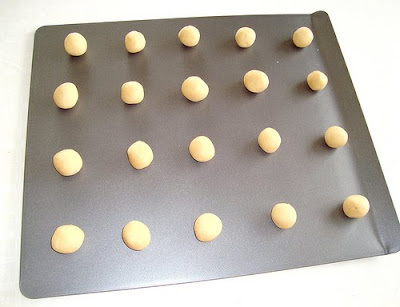 - Roll dough by teaspoonfuls into balls, and place 1 inch apart on an ungreased baking sheet. 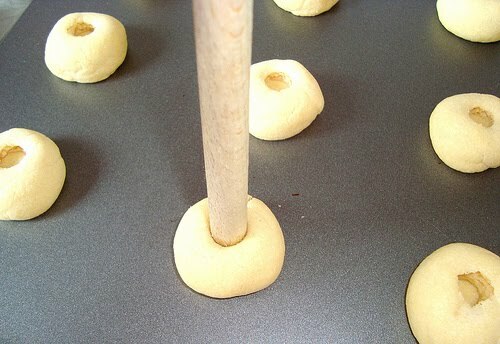 Bake for 10 minutes, remove from oven, and press thumb into tops of cookies to make indentations. (I used the end of a wooden spoon to make the indentations) Return to oven, and bake until light brown on the edges, 7 to 9 minutes more. Remove to a wire rack to cool. 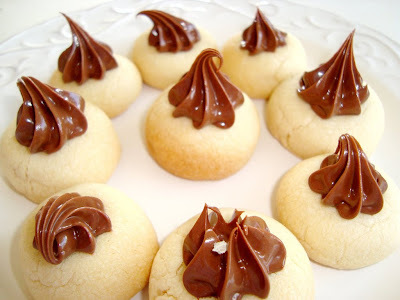 - (I piped Nutella into the cookies) Combine chocolate, 4 tablespoons butter, and corn syrup in a small heat-proof bowl. Set over a pot of simmering water; stir occasionally until melted and smooth. Allow to cool slightly. When cookies are cool, fill the thumbprints with the chocolate mixture. This recipe makes about 2 dozen thumbprints, but I would recommend doubling it, because the cookies are so tiny & little. Using the end of a wooden spoon to make the indentations: shortcut #1. Nutella piped into the thumbprints: shortcut #2. Stuffing my mouth with two thumbprints at the same time: shortcut #3! how adorable are these!! and nutella well what more could be better!! very nice!! Another blogger that I read, ate warm banana bread and nutella last week. If thinking I may overdose on nutella in the coming week. omg, i hate you. ive been lazy all day, but these look soo good, i just have to make them!! !i love nutella also, so ill follow the shortcut! thanks! How perfect! My youngest son (13 years old) has just discovered and fallen in love with Nutella. He would love these cookies. Yours are particularly adorable. If they taste as good as they look, you've got a hit! Love Nutella and I think you've done an excellent translation of the recipe. I want one now! Aren't these thumbprint cookies gorgeous?! Love them! Love shortcut number 3! Have you ever tried Ovomaltine (or Ovaltine as they call it in the US) spread? It's like Nutella, except with little crunchy pieces of Ovomaltine bars and the taste is nice and malty. 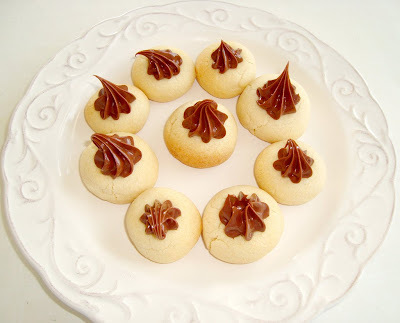 I love it on fresh bread but would love it even more in your thumbprint cookies! These look absolutely perfect! I love Nutella and keep meaning to try Green & Blacks Chocolate spread because it is sure to be delicious, do you have Green & Blacks over there? @Lucie: No I haven't tried Ovaltine yet. I was always a little skeptic about it: the jar looks like a fabric softener! The bright orange hurts my eyes. @How To Be Perfect: Unfortunately not. I think it's sold exclusively in the UK. I have the hugest obsession with nutella. Yummy and a recipe that actually looks attainable! Sometimes Martha's recipes are way over my head! These look wonderful! They remind me of cookies I used to get at a local diner when I was a kid. Can't wait to try them!